Well it’s Anthology time again and the submissions for the next Loose Muse Anthology are piling up very nicely, thank you. This will be the last anthology that the Arts Council of England grant pays for, as the grant that was given to develop Loose Muse over the past couple of years has now been used up. I think we’ve done extraordinarily well in growing things, and certainly we’ve been able to make sure that women writers are given a platform to produce and explore new work, and to share experiences and expertise. The Anthology launch date is set for Thursday, 19th September, and will be held at Cotton’s Caribbean Restaurant – the room downstairs we’ve used for the last couple of launches, and which everyone loves – at 70 Exmouth Market, London EC1R 4QP, 7.00 p.m. for a 7.30 start. So put that into your diary at once whether or not you’ve actually submitted work for inclusion, as it’s always a fabulous night, and it’s FREE, always a bonus. Who knows it might inspire you to take up the pen yourselves, if you haven’t already got the bug. 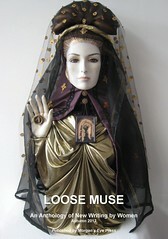 But before then, there’s an EXTRA LOOSE MUSE EVENT IN AUGUST. All OPEN MIC for anyone who wants to share their work. A £5 donation towards Loose Muse expenses in the autumn would be gratefully received. L’Osteria is only a 5 minute walk from Chancery Lane tube station, and on several bus routes, so is very accessible. And, as it’s an Italian restaurant, the food is good and reasonably priced. Do come along and bring something to read, or just come and listen, have a pizza/pasta and be part of the action. Go on…you know you want to.